The purpose of Thunderbolt is simple – the goal is to be the standard for data transfer, display and PCIe connectivity. This means in a single Thunderbolt port a user can choose to use a mini-DisplayPort cable to a monitor, daisy chain several storage devices together, or potentially use the technology to run a dedicated graphics card in a carry case. In the previous generation of Thunderbolt, we were limited to 10 Gb/s by the age of the technology, but now motherboards are coming to market with Thunderbolt 2, capable of 20 Gb/s. To put that into perspective, 4K video running at 60 Hz requires 15 Gb/s. 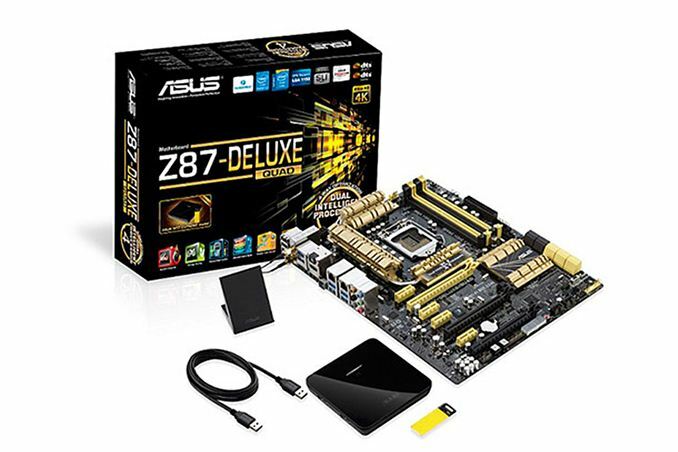 The first motherboard to the market, beating the new Mac Pro, is the ASUS Z87-Deluxe/Quad for Haswell processors. WIth a single Falcon Ridge controller, the motherboard has two Thunderbolt ports, suggesting up to three 4K displays at once (TB, TB, HDMI) can be driven from the processor graphics. Being a Deluxe brand model, we also get ASUS fine touches, such as Intel NICs, 10 SATA 6 Gbps ports (4 from controllers), Dual Intelligent Processors IV and NFC Express. Given such a scenario, along with multi-GPU capability, I would assume that the Thunderbolt controller uses 4 lanes from the PCH rather than the CPU. This would also suggest (without looking closer at the board) that a PCIe 2.0 switch is in place for several of the other features, perhaps making users choose between extra SATA ports of PCIe 2.0 x1 ports on the motherboard. However, there is a heatsink between the first PCIe 3.0 x16 slot and the CPU, perhaps hiding a PLX8747 switch. If the Thunderbolt 2 controller requires a total of 40 Gb/s, this would need five PCIe 3.0 lanes, pointing the figure for sure at a PLX8747 chip. This would give the PCIe layout an x16/0 or x8/x8, albeit via the PLX. Given the number of PCIe 2.0 x1 on board and controllers though, I wouldn’t doubt a PCIe 2.0 switch either. While Thunderbolt is designed to be the new standard in everything connectivity, there have been some issues getting it off the ground. Being an Apple exclusive for 12 months before entering PCs, plus the lack of Thunderbolt enabled devices actually in circulation are two of the biggest barriers. I have a single Thunderbolt device in the office, courtesy of some additional motherboard testing, but the only people I know using the standard are other media. It promises a lot, but we really need those external GPU solutions to get it on the ball. 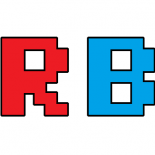 This entry was posted on 2013/08/22 by Ian Cutress in Motherboards, Technology News and tagged Motherboards, NFC, Technology News, Thunderbolt.